Is there a niche in the record biz for U. of C. law student James Ginsburg? His Cedille Records specializes in overlooked classical works performed by underexposed academics. One of the city's most active commercial producing groups is about to lose a principal partner. The Payne-Leavitt Group is expected shortly to announce that cofounder Wes Payne is leaving--amicably, say sources--to take a non-theater-related job in New Orleans, where Payne's wife's relatives live. Fox Associates, the Saint Louis-based group that successfully produced Prelude to a Kiss and Lend Me a Tenor with Payne-Leavitt, will reportedly join with Michael Leavitt to continue producing in the Chicago market. (Leon Strauss, one of the principals at Fox, was at one time a leading contender to operate the restored Chicago Theatre.) Since the collapse of the producing team of Michael Cullen, Sheila Henaghan, and Howard Platt, Payne-Leavitt has emerged as the city's most successful commercial producer. They own and operate the Apollo Theater Center and have a contract to manage and book the Wellington. Both Prelude to a Kiss and Lend Me a Tenor have enjoyed long runs; they've made back $684,000 in combined production costs and are beginning to turn a profit. Michael Leavitt would not discuss any pending developments within the organization. "We'll have an announcement shortly," he said. Representatives from the financially strapped Wisdom Bridge Theatre met with executives from Civic Stages Chicago (formerly the Civic Center for Performing Arts) last week to discuss payment of a $28,000 debt left over from Wisdom Bridge's productions of Kabuki Faust and Hamlet at the Civic Theatre in 1987. The former Civic Center had sued to obtain the funds. According to a source familiar with last week's meeting, Wisdom Bridge said it would try to repay 50 percent of the outstanding debt over three years. The source said a statement of assets and liabilities given to Civic Stages before the meeting listed Wisdom Bridge's liabilties at approximately $750,000 and assets at about $300,O00. James Ginsburg, a University of Chicago law student, is the sole force behind a new, locally based classical music label called Cedille (pronounced say-dee). Though music industry execs say it won't be easy, Ginsburg says he got into the business to make money. His interest is in producing quality recordings of works overlooked by industry giants such as RCA and Sony. Ginsburg honed his ear for classical music during his 12 years as a piano student and then as a classical music critic for American Record Guide. Working out of his Hyde Park apartment, Ginsburg has released three recordings of piano music and one of harpsichord sonatas. A fifth recording--Charles Ives's Concord Sonata and Aaron Copland's Piano Sonata performed by pianist and University of Chicago professor Easley Blackwood--is scheduled for release next month. Reviews of recordings already released have been good to glowing. The three artists in Ginsburg's stable which also includes pianist Dmitry Paperno and harpsichordist David Schrader--all teach at academic institutions and have the musical maturity, he says, to lay down a distinctive interpretation of the music. Ginsburg spent about $7,000 of his own money to produce each recording (available only on compact disc), and he must sell about 1,500 copies of each to break even. His best-seller to date, a collection of Russian piano music performed by Paperno, has sold approximately 700 copies. With a recent change in distributor and ads in key classical music magazines, Ginsburg hopes he will begin to see a return on his investment. 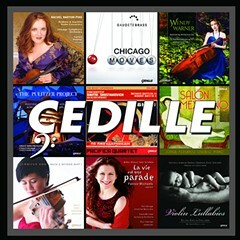 Cedille recordings are available in local outlets of Rose Records and Sound Warehouse. Sales at Sound Warehouse have tailed off recently, but Mark Jenkins, the classical music buyer at Rose Records on Wabash, says Ginsburg "puts out a quality product" and seems to be on the right track. "The market has been flooded with mainstream classical repertoire, so for Cedille to find a niche it makes sense to record the more esoteric material." One of the executive producer s responsible for the new Alan Parker film The Commitments is Chicago-based real estate developer Tom Rosenberg. Released nationwide through Twentieth Century Fox this week and produced by Rosenberg's production company, Beacon Communications, The Commitments is about a group of Dublin teenagers who form a soul music band. Rosenberg and another Chicago native, Armyan Bernstein, formed Beacon in 1989, and they're scheduled to make ten more films for release through Fox. Rosenberg said he had been thinking about getting into the film business for several years when Bernstein suggested they team up. "He deals with the artistic end," said Rosenberg, "and I deal with the business end." Rosenberg said Beacon is interested in making good movies, though not necessarily big-budget ones; The Commitments cost $13 million. The Museum of Contemporary Art will lose a third of its curatorial staff on August 30. Bruce Guenther, the museum's chief curator for the past four years and one of three curators currently on staff, has resigned to pursue independent curatorial projects and do some writing; he may leave Chicago at the end of 1991. An MCA spokesman said there were no apparent personality conflicts in the organization that would have prompted Guenther's departure; Guenther said simply that by leaving now he's allowing time for the museum to groom a new curator who can help prepare the MCA for its move to a new building in the spring of 1995. But when Guenther was asked whether there were any differences in style between himself and MCA director Kevin Consey, Guenther said he was more oriented toward a "team approach," while Consey was a "hierarchical director." Consey arrived at the museum about a year and a half ago. The search for Guenther's replacement is under way. Art accompanying story in printed newspaper (not available in this archive): photo/Steven D. Arazmus.